These sure-lock Black Nylon Kwik-Links are self threading nylon for 2MM (0.079") rods or threaded couplers. Ideal for replacements on imported A.R.F. 's and kits. Unit looks like nylon clevis 2nd from right except is black. Comes with standard press on nylon and permanent steel press on retainer. Also equipped with socket head fastener to allow for tighter installations. Drilled to clamp onto 2-56 and 2mm rods. This brass connector has hex head to allow you to hold it while tightening. GWS rack of 6 L bend ratainers. Simply bend an "L" into the end of your wire, put the eyelet of this retainer over the L end then clip the base over the leg of your wire. Perfect solution for quick and easy pushrod ends. Comes with standard press on nylon and permanent steel press on retainer. Also equipped with socket head fastener to allow for tighter installations. Drilled to clamp onto 2-56 and 2mm rods so common in ARFS. Use on 2mm pre-threaded pushrods. Metal clevis pin with safety retainer. 2 each package. Used to connect a 2mm pushrod to a control such as a control horn or throttle lever. Four barrels, washers, nuts and set screws. Allen wrench not included, requires 1.5mm. Will work on any rod size 1.5 to 1.85mm (.074"). 2mm pushrods and 2-56 are usually this size or smaller. The threads are rolled and larger than the base wire diameter. Instal in 5/64" (1.9mm) hole. Four barrels, washers, nuts and set screws. Allen wrench not included, requires 1.5mm. Will work on any rod size 1.5 to 2mm (.079"). 2mm pushrods and 2-56 are usually this size or smaller. The threads are rolled and larger than the base wire diameter. Install in 7/64" (2.6mm) hole. Clevis threads onto 2mm shaft. Metal clevis pins are 1mm od (.039). May also be used with micro size .032" drilled control horns with very minor increase in hold diameter. Very light weight design. 10 clevis and pins per package. 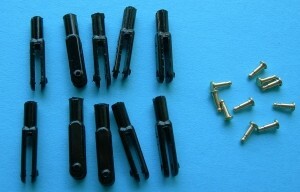 Package of extra snap pins for this clevis is pn#MPJ2102. Clevis threads onto 2mm shaft. 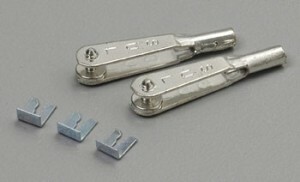 Metal clevis pins are 1.6mm od (.063 1/16"). May also be used standard horns designed for typical 2-56 hardware. However, must be threaded onto a 2mm pushrod thread. Very light weight design. 10 clevis and pins per package. 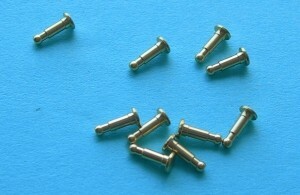 Extra snap pins are PN# MPJ2112. 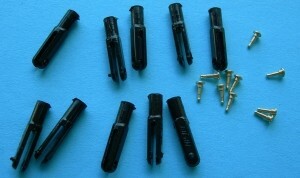 Extra snap pins for MP Jet Micro Clevis. Control horn engaging section of pin is 1.0mm. Extra snap pins for MP Jet small Clevis. Control horn engaging section of pin is 1.6mm.